Einstein’s theories of Special Relativity and General Relativity deal with the nature of light and gravity in a manner that he could not – with the technology of the day – directly experiment with and observe. That was no object to Einstein, because his main method of discovery was not through physical experimentation, but rather experiments run in his mind, what he called thought experiments. “It’s what you and I would call ‘daydreaming’, but he gets to call them thought experiments because he’s Einstein” says one Einstein biographer. For this examination of flat earth theory, we will take up Einstein’s method of the thought experiment, and think through the consequences of physics if the earth were, as the flat earth adherents claim, flat, shaped like a pancake. Please take a few moments to view if not familiar with the flat earth model. Got the picture? Okay, let’s commence with our thought experiments, which will highlight a number of insurmountable problems for this flat earth model. a) What makes the sun and moon orbit around the vertical axis? Notice how the sun and moon are circling the earth. According to both Einstein and Newton, the only way those objects could be circling the earth like that is if there were some massive body at the center of their orbit. But a massive body is not visible on the vertical axis anywhere on the earth, and the flat earth model allows for no such massive body. There’s another problem even if the flat earth model did allow for such an object. Since the earth itself is not in orbit around the object, the earth would fall toward the object and crash into it. Yet it hasn’t, likely because such an object doesn’t exist. But the non-existence of such an object is a death blow to the flat earth theory. b) What keeps the satellites from falling into the gravitational groove at the edge? The arrows in the picture above show conceptionally how gravity on a flat earth would be greatest around the edge of the earth and weakest at the center. This would create a gravitational grove or rut of curved space around the flat disk of the earth that would cause all satellites to fall towards the arrows of greatest length (where gravity is greater) and thus eventually fall into the gravity groove at the edge. Like the problem with the sun and moon, there is no massive object (like a large central sun; the flat earth sun is estimated to be only 32 miles in diameter and it’s not central or stationary) to keep satellites (especially geosynchronous ones) in orbit above the mass of the flat earth where people live. Thus all satellites would fall into the curved space gravitational groove around the earth created by the mass of the flat earth disk. Having GPS satellites fall into orbit around the edge of the flat earth would of course be very problematic for GPS and communication satellites – they would cease to work properly, becoming largely ineffective. The “Firmament” to the rescue? But there are problems with this model – where the sun and moon are part of the solid firmament – too. Let’s look first at an objection that Einstein would likely have, then we’ll take a look an the word “firmament” to see if flat earth believers are interpreting it correctly. Problem 2: – Where are all the Gravitational Waves? 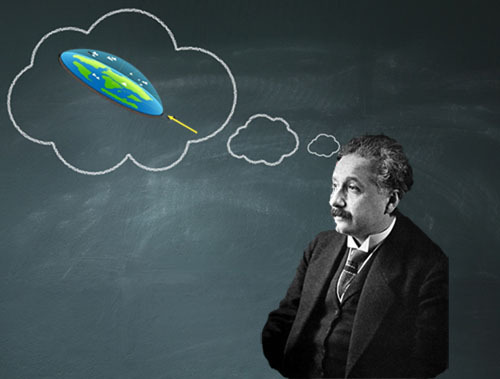 Einstein’s theory of gravity – General Relativity – predicts that moving objects create a ripple in space-time which move at the speed of light. He called such ripples gravitational waves. Most gravitational waves are too small and minute to be detected. But large gravity waves can be detected by LIGO -the Laser Interferometer Gravitational-Wave Observatory operated by Caltech and MIT. LIGO consists of two L-shaped, gravity wave detectors – one at Washington (LIGO Hanford), and one at Louisiana (LIGO Livingston) and the two work together in concert to provided a verified detection of gravitational waves. The most recent detection was on January 4th, 2017, when the two LIGO detectors detected the gravitational wave generated by the merging of two black holes some 3 billion light years away. If LIGO can detect a gravitational wave made by a tiny, minute portion of the universe (2 black holes out of all of the stars and black holes in existence) that’s 3 billion light years away, why isn’t it detecting the gravitational wave generated by the rotation of the entire universe (all stars and all black holes) only 3,000 miles away? If, as the flat earth believers state, all the heavenly bodies are embedded in the firmament, and the firmament is rotating every 24 hours, and it’s only 3,000 miles away, it should be generating such massive gravitational waves that LIGO is lit up all the time, 24/7. But that is not the case. The LIGO gravitational wave detections are few and far between. That alone sounds the death knell to the proposition that the sun, moon stars and all the other heavenly bodies are embedded in the “firmament” and rotating in a daily cycle 3,000 miles above a stationary earth. So there are problems if the Sun and moon are not embedded in the firmament; and there are problems if they are embedded in the firmament. But where did flat earth believers get this idea of a “firmament” from? The idea comes from a misunderstanding of a Biblical text. The bolded word in the original Hebrew is רקיע ( rāqīă‛ – raqiya ) and is translated by the NIV (1973-1984) as “expanse” and by the KJV and NKJV as “firmament.” (The current NIV translates it as “vault” which seems to lean toward a solid firmament.) “Expanse” points to something that is spread out and thus expansive, while “firmament” points to something that is solid – as the flat earth believers take it. But which one is it? The general rule for interpretation of the Bible is to let scripture interpret scripture. And we have a verse in scripture that speaks specifically of the act of creation that can clarify matters: Is 42.5. Notice how a posture verb (walk, stand, sit) is followed by a word that describes a sinful person (wicked, sinners, mockers). The Hebrew rhyme is detectable even though the English words don’t rhyme. There are a number of rhyming statements here, but lets focus in on the words in question which I’ve highlighted in yellow. (I’ll just note in passing that the verb “created” used here is the same verb – ברא [ bārā’ – bara] used in Gen 1.1 – “In the beginning, God created,” used here in participial form.) The word used for “stretched out” is the verb נטה (nātāh – natah)- to stretch out, to spread out. And what word is it rhyming with? That would be our old friend רקע (rŏqă‛ – roqah) the participial form of the verb, which has the cognate noun רקיע ( rāqīă‛ – raqiya ) used in Gen 1.6. Recall raqiya could mean either an extended solid surface or a stretched out expanse, but the rhyming word – natah – means to stretch out. So the meaning of raqiya here, to complete the rhyme must also mean to stretch out, or expand. And remember, this verse is paralleling the ideas in Gen 1.6. So the idea in Gen 1.6 is not the idea of a solid firmament. It must be the idea of a stretched out expanse. Cosmologist Russell Humphreys spoke about this stretching of the expanse in his recent visit to Creation in the 21st Century with David Rives. Thus at the end of the day, flat earth adherents have misinterpreted one of the basic texts used to support their theory. 1. Flat earth theory cannot account for such an object – since all heavenly bodies are in the firmament. The only thing above the firmament are the waters above the sky (Gen 1.7, Ps 148.4). But the waters above the sky are understood to be resting upon the firmament; in fact the firmament is supposed to be keeping those waters out. If you place a magnet on your refrigerator, it stops moving once it comes in contact with the refrigerator since there’s no more distance to move through to reach it. Likewise if the waters above the sky are above resting upon the firmament, there is no space for the firmament to move through, so the waters would not be accelerating the firmament beneath it. Dark Energy has been proposed, but dark energy (if it exists) doesn’t accelerate masses, it thins out space. When the myth busters Adam Savage and Jamie Hyneman set out to prove that the NASA moon landings were not a hoax, one of the proofs they adduced was the reflection of a laser beam from retro-reflectors placed on the moon (which reflect light back at the source regardless of the angle). They went to the Apache Point Observatory Lunar Laser-ranging Operation observatory (APOLLO) where they saw the return from a Gigawatt laser pointed at the moon. The distance to the moon is about 240,000 miles. But the diameter of the earth, according to flat earth theory, is only 25,000 miles. So the flat earth, from end to end, is roughly one tenth the distance of the accepted, standard distance to the moon. Therefore the myth busters, or anyone else, should be able to shine a laser beam from one end of the flat earth to the other, assuming they’re high enough for the beam to go over the mountains. Many observatories are built upon mountains, so that shouldn’t be an issue. So an easy proof for flat earth believers would be to shine a laser from one end of the earth to the other, and have it reflected back. That cannot be done if the earth is a globe. With today’s technology, this seems to me to be an easy proof. But getting access to an observatory may prove difficult. Here’s an easier test. You don’t really need to shine the light from one end of the earth to the other. To disprove a globe shaped earth, all you need to do is prove that light is visible past the supposed curvature of the earth. For instance you could go a tall building like the Willis (formerly Sears) Tower in Chicago, or the CN Tower in Toronto. Let’s take the CN tower. Its observation deck height according to Google is 447 m or 1467 feet. Next you need to calculate the distance to the horizon – beyond which you cannot see due to the curvature of the earth. Luckily there’s a site that will calculate that for you called Metabunk: https://www.metabunk.org/curve/. Just plug in your height, and it gives you the distance to the horizon, and even corrects for refraction by the atmosphere. For the CN tower, corrected for refraction, distance to the horizon is 50.66 miles. So if the earth is curved like a globe, you shouldn’t see a light from the tower beyond 51 miles. On the other hand, if the earth is flat, you should easily see the light from a distance of say, 100 miles. With a laser pointer and a trip to the CN tower, that is an easily do-able test. Station an observer 100 miles from the tower, go to the observation deck of the CN tower, and shine your laser pointer in the direction of your observer. Figure out some Morse code like unique signal to make sure your observer correctly identifies the light from the tower and have at it. An easy test. So the question becomes, why have none of them done that to end all doubt? Why instead do communication experts tell us that radio communications are limited in distance due to “line of sight transmission?” Meaning that due to the curvature of the earth, radio transmissions (all in the EM spectrum including light) can only be received for limited distances. The answer to that gets us to an area which is a departure from the workings of the theory, but worthy of mentioning in passing. Flat earth believers, must necessary believe there is a grand conspiracy in order to explain much otherwise un-explainable phenomenon. Like space travel, which is impossible due to the firmament. Therefore NASA must be lying, and it’s all a grand conspiracy. Due to the problems with the gravitational groove and satellites mentioned above, I still don’t know how they explain how GPS devices work since the GPS satellites could not stay in orbit. (Much less get to their 12,500 mile orbital altitude past the 3,000 mile altitude of the solid firmament.) But it’s not just NASA, it’s a myriad of things: Radio distance limitations due to the curvature of the earth must be a lie; the shape of Antarctica is a big secret. (They believe it’s a 200′ wall that surrounds the flat earth that keeps the oceans from falling off the edge.) Photos from space – especially of the earth – Photoshopped. The Chinese space program, false. In fact, all NASA missions to outer space, (The Moon, Mars, Saturn, Pluto, etc.) are all hoaxes. All lies to support the grand conspiracy. So if you want to join the ranks of flat earth believers, then you must become, by definition, a conspiracy theorist. And you’ll fit perfectly the profile I describe in Doubt the Bible? You might be a Conspiracy Theorist. 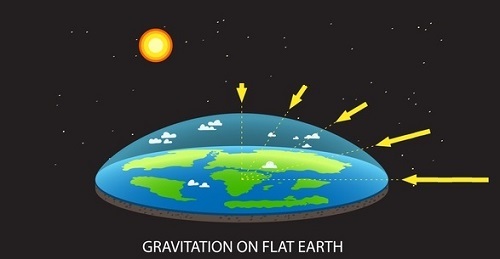 The flat earth view fails at a couple of points: the earth is not in orbit around the sun in the flat earth view; and it has not assumed a nearly round shape because there is no gravity. No Sunrise/Sunsets: Do you like sunrises or sunsets? Kiss them good bye with the flat earth model. At 3,000 miles above ground level, the sun will never be seen to be rising or setting over the horizon. Ditto for the moon. Always visible sun: If the earth is flat, the sun would be visible all the times, 24 hours a day. As noted above, it would never set behind the horizon. Daily lunar phases, not monthly: We’d see all phases of the moon every day. All of them – new moon, 1/4 moon, 1/2 moon, 3/4 moon, full moon and everything in between – every day, not monthly. Obviously the items above are nothing like the world we observe. So if nothing else, this should serve to demonstrate that belief in a flat earth not only does not match the observable evidence, but it is also a detour off the scriptural path that leads you to a place that has nothing to do with the doctrine of Creation. 11. Flat earth believers do in fact acknowledge such a grand conspiracy. This entry was posted in Bible, Conspiracy Theory, Flat earth, General Relativity, Gravitational Wave and tagged Albert Einstein, John Hartnett, Michio Kaku, Russell Humphreys by Duane Caldwell. Bookmark the permalink. Hmm, I don’t completely buy that flat-earthism in the English-speaking world “is and always has been entirely based upon the Bible.” But to the degree that it is, as this article points out, 1. It’s a misunderstanding of the applicable texts and 2. This article is to distance flat-earthism from Creationism. Deny all you want, your examples made clear what you said. My response was equally clear. I have read that six times. It makes no sense. What do you imagine I denied here? Exactly?